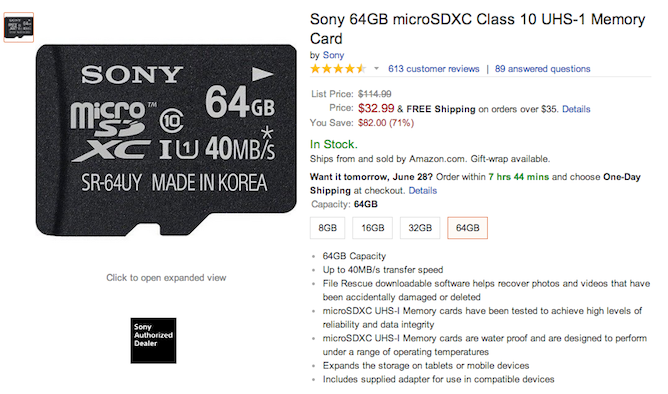 Amazon's Gold Box deals always tend to gravitate back to flash memory storage every few weeks. 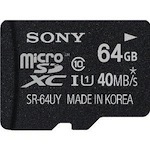 Today is another iteration with discounts on many Sony SD cards, USB drives, and more interestingly for mobile users, microSD cards and microUSB OTG flash drives. If your phone has a microSD slot and you want to add extra storage for your media files, you may want to pick up the 64GB microSD Class 10 card for $33 instead of $115. The smaller variants are also discounted, with the 32GB going for $16 instead of $55, and the 16GB on sale from $29 to $9. As with all Amazon Gold Box offers, these are Prime compatible and are only valid today while supply lasts.